Everyone has their predilections and pet topics. For some, it's politics; others it's model airplanes; and for some unfortunates, it's Kim Kardashian. I have several pet topics that I periodically obsess about, and one of them is Agatha. Which Agatha, might you ask? Well, considering that there aren't as many famous Agathas as there should be, you probably guessed that this one is Agatha Christie. My first taste of her literary awesomeness was when I was a wee lass of 14, travelling on a plane to somewhere or other. I devoured Murder on the Orient Express in no time flat - I couldn't believe how she managed to bring all the threads together into an incredibly satisfying (if somewhat incredulous) denouement. I didn't realize that she was the prolific novel making machine I now know her to be, so I didn't try to find another one to read. Cut to a few years later - I was in Heathrow airport and nearly out of books to read before my return flight. How this happened, I'll never know... it must have been fate to send me into the nearest bookstore. There was a huge display of her books and I realized that there was a whole world to explore! I picked up The Hollow and a couple of others. By the end of the flight, I was completely hooked and jonesing for more. I've read almost all of her mysteries now, with only about 15 left to finish off the canon. 1) Her characters are perfectly flat. People criticize her for this, but they are failing to see that they need behave according to certain "types" to get the plots off the ground. I don't mean that they aren't believable or that she's lazy - it's simply that her plots revolve around playing with types and her ability to distract you from a character's innate type that makes him or her a killer. The gold-digging husband killer is inherently a gold-digging husband killer, no matter how charming and beautiful she may also be. Christie's plots are based on your ability to determine what type everyone is. If you do this correctly, you will always identify the killer, no matter how much other stuff is going on. These flat characters are also really well drawn - I compare her to Jane Austen, in that she has that ability to quickly paint a picture of a character so that you know exactly what kind of person they are. Don't we all know a Mr. Collins? Don't we all know a Captain Hastings? 2) Stuff happens. I'm sorry, I do love books where the main show is how beautifully it's written or that it's a piercing insight into a character. But I also need a reason to keep turning the page, and the most powerful way to do that is the burning question, what happens next?! Agatha does that effortlessly and you really want to know what's going to happen. 3) There is a lot of humor and the violence is not graphic. I like what are called "cozy mysteries," and Agatha fits neatly in that category. Basically, I don't want to read an explicit account of a woman being raped and murdered. I don't want to read about bulging veins as someone is being strangled or the dripping blood from a screwdriver in someone's head. That's just my personal preference. There is a lightness of touch and a lack of dwelling on morbid or gruesome details that makes these murder mysteries palatable for me. Besides, how often to do you laugh out loud while reading about a serial murderer? So for those of you who are intrigued but may not know where to start with her 82 mysteries, may I suggest a few titles? 1) Murder on the Orient Express: This is the one that started it all for me. It's a Poirot mystery, set on the titular Orient Express, and it definitely showcases Christie's mastery of plotting and her ability to build suspense. It's a classic, one of her best known books. 2) And Then There Were None: One of the "standalone" novels that doesn't feature a recurring detective, this is arguably her best and most famous work. Set on a spooky, isolated island with an unknown host, this will satisfy those who love locked-door mysteries (me!) and the creepy nursery rhyme helps her build the tension to the point of breaking in a very satisfying manner. 3) The Thirteen Problems: I love, love Agatha's short stories. They really show case her skills and are just enjoyable little snacks. This particular collection features everyone's favorite spinster sleuth, Miss Marple. Her best full Marple novel, in my opinion, is The Body in the Library, but I think this collection is the best use of Miss Marple. 4) The Mysterious Affair at Styles: I may have to say that this is my favorite of the Poirot novels... it's also the very first one. It's a country house mystery, which is my kryptonite, and it sets up all the hallmarks of her parlor tricks. 5) Crooked House: This is possibly my favorite Agatha Christie mystery. It's a standalone, it's a closed door mystery, and it hinges on the psychology of a wide cast of characters to figure out the twist. 6) The Murder of Roger Ackroyd: A classic much lauded for breaking convention, it's a must read in the Poirot series. It's also one of the few first person narrations in that series that isn't Hastings. 7) The Seven Dials Club: And finally, this is a personal favorite, though I don't know how widely loved it is. It's an example of one of her international thriller type mysteries and it has the spunky Lady Bundle Brent as the intrepid heroine. 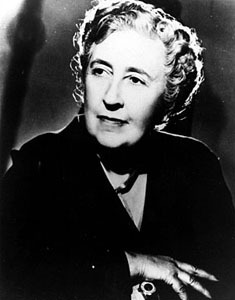 How about you- do you have a favorite Agatha Christie? Or maybe your own pet author?